It takes a one-of-a-kind guitarist to play country licks while looking like a ghoul, and John 5 is just that ghoul, er, guy. In recognition of his renowned vision and accomplishments, Zoom has partnered with the guitarist to create the G1J John 5 signature effects pedal. 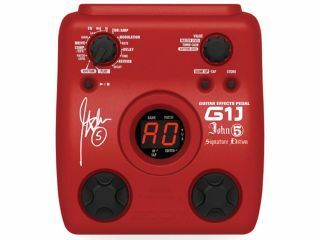 The G1J offers 40 patches emulating John 5's choice sounds and 40 open to the user's creativity. With the dry, edgy tube amp sound of American Witch, the warped, apocalyptic sound of Dooms Day or even the clean, twangy sound of Country Shred, aspiring guitarists can add a touch of John 5 to their own, unique riffs. The G1J features 32-bit processing and 96 kHz sampling with a built-in drum machine and harmonized pitch shifter. It operates on four AA batteries or an included AC power adapter. And check this out: you even received a custom poster, patch list, specially designed pick and a greeting card from John 5. Did somebody say "Deal"? So break out the lipstick and get ready for country-metal weirdness. For more information, be sure to visit the official Samson website.